Fortunately for those who haven't pre-ordered the iPhone 4S or sold their old iPhones, iOS 5 isn't a destroyer--at least it didn't cripple my iPhone 4, which has been running the Gold Master Beta of iOS 5 since last week. So rest easy; you have a lot to look forward to with iOS 5. First we'll recap the bad news, though. Siri: If you're smitten with Apple's futuristic voice-operated personal assistant, you'll need the iPhone 4S: Siri requires that model's dual-core A5 processor. But Siri may not be your thing, and if it is, there are several Siri alternatives that work great on older-model iPhones. AirPlay Mirroring:AirPlay Mirroring allows users to project what's on their iPhone 4S or iPad 2 onto the big screen, either through an AirPlay-connected HDTV or an Apple TV 2. If you want the convenience of AirPlay but don't want to upgrade, the Lifehacker site has great alternatives and a guide to making everything in your home AirPlay compatible. iCloud: Back up your calendar, email, iWork documents (sorry, Microsoft Office), phone contacts and more, and access them all on your iOS 5 device, your OS X Lion-, Windows Vista- or Windows 7-equipped desktop, or via Apple's slick Web interface. iCloud also remembers your past App Store purchases, so deleted apps or songs can be re-downloaded easily. Each iCloud account comes with 5GB of free storage; larger lockers cost $20 for 10GB, $40 for 20GB or $100 for 50GB, and can be purchased right from your phone. Most syncing requires a Wi-Fi connection and that your iPhone be plugged into a power source, so it's not completely wireless, but close enough for most. iTunes Match: Apple's answer to the cloud music craze streams your iTunes library to your phone, so that eventually, you may be able to ditch hefty hard drives on your iPhone and access your entire song library remotely. Photo Editing: The new photo-editing capabilities that are built into the iPhone's standard camera are minimalist but workable. Now, when you click the Edit button in your Camera Roll, you can crop, reduce red eye, or auto-enhance an entire photo. These features aren't nearly as in depth as other photo editing apps, such as Adobe's free Photoshop Express, but are great for touching up a picture on the go. Quick Camera Access and Grid Shots: You now have instant access to the default camera by double-clicking the home button on your iPhone's lock screen. 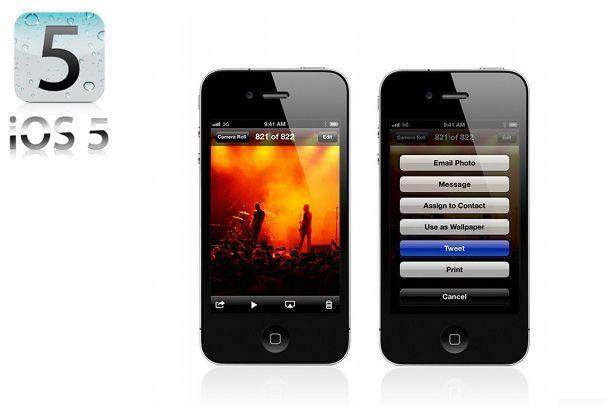 You can also use the volume up button as a shutter and use a grid overlay to stage your photos. iMessage: Your iOS 5 friends can now reduce their text message plans (if your carrier hasn't eliminated that option, like AT&amp;T did) by using Apple's BlackBerry Messenger look-alike that functions essentially the same as SMS but doesn't work against your reserves and can include "read" receipts. Twitter: If you're not already a Twitter user, iOS 5 may make you one. Twitter is everywhere on iOS 5, including on Maps and in the Safari options menu, and it looks gorgeous. When you're setting iOS 5 up, Apple even asks if you'd like to download the official Twitter app. Sorry, Facebook. Short Messages: Under General > Keyboard > Shortcuts, you can save time by adding your own shortcuts, such as brb for "Be right back." What's an iOS update without a few glitches? Well, iOS 5 may be the first major update I've seen that's almost flawless. I've only noticed slight lag in album art graphics when changing songs from the lock screen in my short tests--and that's it.